​We work with & offer discount to rescue groups. Agility Training: If your dog is not good with other dogs & therefore can't do our "Agility For Fun" class, you can still give them the opportunity to engage in this mentally & physically stimulating sport for fun via private session at our facility. Pricing for private agility session is different, so please contact us for information. Private sessions are great for “puppies” that have not completed their shots or are not quite ready to start classes. Because of our use of gentle training methods, your puppy can start his/her training with us as early as 8 weeks* of age. Private sessions are a good opportunity for owners to ask questions and discuss common puppy issues like housetraining, crate training, puppy nipping, grooming, diet, etc., and learn how to prevent future problems from developing. Whoever said “you can’t teach an old dog new tricks” wasn’t talking about the dog. Training doesn’t have to end just because your canine pal is not as active or physically fit due to age or health issues. On the contrary, private sessions can provide your “senior” pal with the kind of mental stimulation s/he needs to perk up. It can give him a purpose, something to look forward to in his day. From low-impact tricks to ‘I can’t get enough’ interactive games, there are many options for the seasoned canine. Utilizing your dog’s well-functioning senses, olfactory being the strongest, in a playful manner can be very rewarding to your dog, not to mention the joy you’ll feel in watching him regain his confidence and perform the task with enthusiasm. Working owners: Pet owners who do not have time to train regularly with their pets due to long work hours or frequent scheduling conflicts. Injured individuals: Individuals with restricted mobility due to an injury or health concern. Puppy parents: Puppies need regular potty breaks. Combing that with training ensures that your puppy gets the best of both worlds, housetraining and early start on manners training. So even if you're pup is not ready for classes, s/he can start training at home. As in most situations in life, consistency and practice are necessary in achieving success in your dog’s learning. Most training attempts that fail are due to the limited time and commitment that owners are able to put in to the training program. With Day Training, which is a one-on-one session between the dog and trainer, your dog will receive a consistent, ongoing education. To help resolve behavioral issues, training accurately and consistently is so vital to the program that failure to do both can cause the behavioral problem to worsen. Therefore, having a professional administer the prescribed protocol correctly each and every time will help you progress in your training if you are not getting it right every time. Therefore, doing Day Training for Behavior Modification purposes, is intended to be a supplement to support you and your dog’s ongoing training. Our Day Training Program includes a private session with the owner(s)* already built in to the cost of the program to allow for the transfer of information and skills. Please call or email to set up a consultation for your day training program. *Please note, any sessions that the owner is present for, other than the included session, will be charged the Private Session Rate. All dog training programs require an initial consultation to meet and evaluate the dog in order to determine the right training service for both owner and pet. Private sessions are beneficial for high-energy “adolescent dogs” that are going through the “I don’t know what you’re talking about” phase. 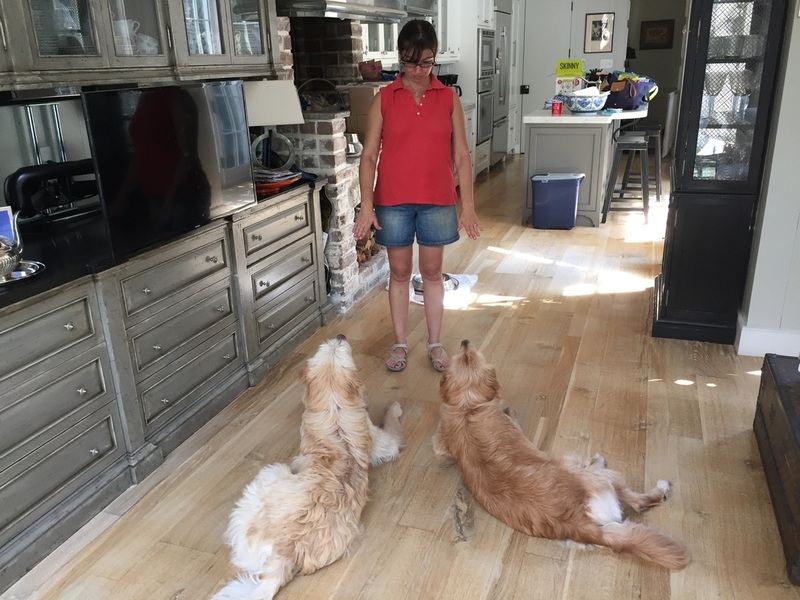 Working on compliance, teaching new cues for communication and mental stimulation, and practicing impulse-control exercises in the calm, non-stimulating environment of the home is sometimes a better option for dogs of this age than a highly-distracting class setting. Similarly, the home can be a more productive and successful learning environment for “petite dogs” who, due to their small size, can feel overwhelmed and lack confidence when placed among a group of large, unfamiliar dogs. Research shows that high levels of stress and fear significantly hinder learning ability in both humans and animals. By training in a familiar and comfortable setting, your little companion can thrive and excel in his/her training with better results. Shy, fearful, reactive or aggressive dogs usually don’t do well in class settings* because they feel trapped amongst the very things that cause them discomfort. Private sessions on the other hand, allow owners and their dogs to work on these issues in a controlled setting where the dogs can keep their composure (stay under threshold) and concentrate on learning rather than reacting. It’s important that any type of behavior issue be addressed early on. Any behavior that is practiced for an extended period of time will be deeply routed in that dog’s response patterns and will be difficult to alter. Whether the behaviors were learned by the dog through trial & error, unintentionally encouraged by owner(s) or are a reflection of the dog’s genetic makeup, they are always governed by the dog’s physiological (emotional) state. So owners should understand that this is not about the dog’s lack of obedience or compliance, and therefore cannot be resolved through basic training and punishment. The protocol most appropriate for addressing such behavior issues is Behavior Modification, the altering of how a dog feels toward a person or object (trigger) that causes him/her immense discomfort. For example, If you were riding in a bus and someone yelled “loose snake”, how likely are you to comply with the driver’s request to “stay seated?.” Not likely.